MINNEAPOLIS — It was past quitting time at a new textile factory here, but that was not the only reason the work floor looked so desolate. Under the high ceilings, the fluorescent lights still bright, there were just 15 or so industrial sewing machines in a sprawling space meant for triple that amount. The issue wasn’t poor demand for the curtains, pillows and other textiles being produced at the factory. Quite the opposite. The owner, the Airtex Design Group, had shifted an increasing amount of its production here from China because customers had been asking for more American-made goods. The issue was finding workers. “The sad truth is, we put ads in the paper and not many people show up,” said Mike Miller, Airtex’s chief executive. The American textile and apparel industries, like manufacturing as a whole, are experiencing a nascent turnaround as apparel and textile companies demand higher quality, more reliable scheduling and fewer safety problems than they encounter overseas. Accidents like the factory collapse in Bangladesh earlier this year, which killed more than 1,000 workers, have reinforced the push for domestic production. But because the industries were decimated over the last two decades — 77 percent of the American work force has been lost since 1990 as companies moved jobs abroad — manufacturers are now scrambling to find workers to fill the specialized jobs that have not been taken over by machines. Wages for cut-and-sew jobs, the core of the apparel industry’s remaining work force, have been rising fast — increasing 13.2 percent on an inflation-adjusted basis from 2007 to 2012, while overall private sector pay rose just 1.4 percent. Companies here in Minnesota are so hungry for workers that they posted five job openings for every student in a new training program in industrial sewing, a full month before the training was even completed. Like manufacturers in many parts of the country, those in Minnesota are wrestling with how to attract a new generation of factory workers while also protecting their bottom lines in an industry where pennies per garment can make or break a business. The backbone of the new wave of manufacturing in the United States has been automation, but some tasks still require human hands. Nationally, manufacturers have created recruitment centers that use touch screens and other interactive technology to promote the benefits of textile and apparel work. Here, they are recruiting at high schools, papering churches and community centers with job postings, and running ads in Hmong, Somali and Spanish-language newspapers. And in a moment of near desperation last year — after several companies worried about turning down orders because they did not have the manpower to handle them — Minnesota manufacturers hatched their grandest rescue effort of all: a program to create a skilled work force from scratch. Run by a coalition of manufacturers, a nonprofit organization and a technical college, the program runs for six months, two or three nights a week, and teaches novices how to be industrial sewers, from handling a sewing machine to working with vinyl and canvas. Eighteen students, ranging from a 22-year-old taking a break from college to a 60-year-old former janitor who had been out of work for three months, enrolled in the inaugural session that ended in June. The $3,695 tuition was covered by charities and the city of Minneapolis, though students will largely be expected to pay for future courses themselves. After the course, the companies, which pay to belong to the coalition, sponsored students for a three-week rotation on their factory floors and a two-week internship at minimum wage. Then the free-for-all began as the members competed to hire those graduates who decide to pursue a career in industrial sewing. Last year, there were about 142,000 people employed as sewing machine operators in the United States, according to the Bureau of Labor Statistics. In the Minneapolis-St. Paul metro area, which had almost 1.75 million workers last year — and where the unemployment rate as of July was 4.9 percent — only 860 were employed in 2012 as machine sewers..
Airtex had room for 50 of them. “We are looking for new sewers every day,” said Mr. Miller, the Airtex executive. Airtex’s roots in Minneapolis date to 1918, when Mr. Miller’s grandfather started the Sam Miller Bag Company, specializing in potato and feed bags. In the 1980s, Susan Shields founded a baggage company, and the two combined in 2000 as the Airtex Design Group, producing home textiles for companies like Pottery Barn and Restoration Hardware. Soon after the merger, the company began producing in China, first in the Dongguan area, then Wuxi and Shanghai. Today, it still employs about 100 Chinese workers through a partner factory in Dongguan, but production there is no longer the bargain it once was, said Ms. Shields, Airtex’s president. Initially Airtex paid $3 an hour on average for its Chinese workers; now, it pays about $11.80 an hour, including benefits and housing. Its American factory-floor workers make about $9 to $17 an hour, though Airtex estimates benefits add another 30 percent to those figures. As costs were rising in China, Airtex was also getting a new message from some of its clients: They wanted more American-made products. Health care clients wanted medical slings and other sensitive medical products made domestically to ensure quality. Retailers did not want to pay overseas freight costs to import bulky items like pillows, and they wanted more flexibility in turning around designs quickly. As Airtex considered production in Vietnam and elsewhere, it became concerned about safety and quality issues — and increasingly interested in the American alternative. But the lack of workers here in Minnesota made shifting business back home frustrating. It had gotten to the point where new business sometimes felt like a headache, not an opportunity. As Mr. Miller was headed to Chicago for a sales pitch in February, for instance, he was more worried than excited about landing a new contract. In the various waves of American textile production, dating to the 1800s, the problem of an available and willing work force solved itself. Little capital was required — the boss just needed sewing equipment and people willing to work. That made it an attractive business for newly arrived immigrants with a few dollars to their name and, often, some background in garment work. Typically, the mostly male factory owners would recruit female workers from their old countries for the grunt work. From the 1840s until the Civil War, it was new arrivals from Ireland and Germany. From the 1880s through the 1920s, it was Russian Jews and Italians, who would buy newly mass-produced Singer sewing machines and often set up shops in their tenement apartments with wives, daughters and tenants making up the initial work force, said Daniel Katz, provost of the National Labor College and author of a book about the garment industry. Puerto Ricans, who were given citizenship on the eve of American entry into World War I, and black migrants from the South rounded out the work force until the 1960s, when Chinese and Dominican laborers took over, Mr. Katz said. In San Francisco and New York, a small number of Chinese women came to the United States despite the Chinese Exclusion Act in 1882 barring Chinese laborers, making up a base of garment workers. After 1965, when immigration restrictions eased and Chinese were allowed to join family members, greater numbers of women came and that pool of workers grew. “It was pretty well known that basically the day after you landed, you’d be taken to a factory by a relative to learn how to use an industrial sewing machine,” said Katie Quan, associate chair of the Labor Center at the University of California, Berkeley. In Los Angeles, Latinos made up much of the work force. And in the Carolinas, Hmong immigrants filled textile manufacturing jobs well into the 1990s, halting — or at least delaying — the migration of jobs overseas, said Rachel Willis, an American studies professor at the University of North Carolina. Now, here in Minnesota, immigrants are once again being seen as the new hope. 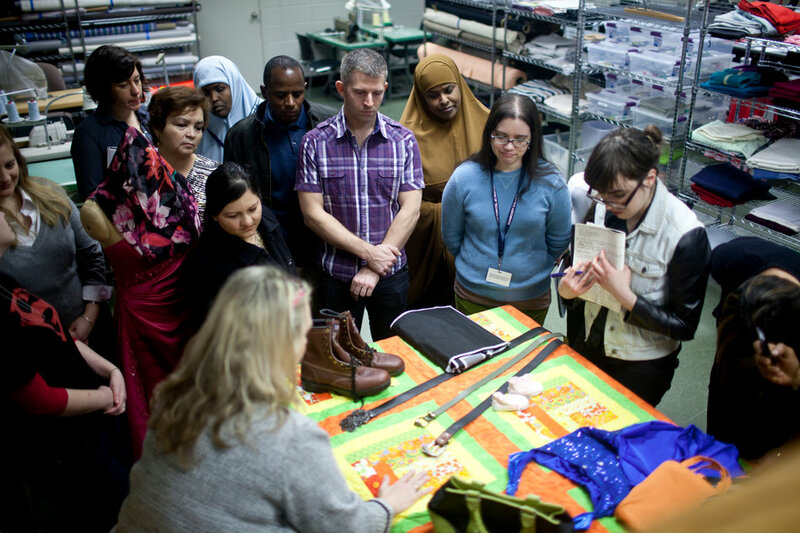 Last fall, Lifetrack, a nonprofit group in St. Paul that helps immigrants, people on welfare and those with disabilities, began screening clients for possible admission to the sewing training program. Inside a gray-green room in a building on the edge of a four-lane road, people gathered around three tables: Burmese women at one of them, Ethiopian men at another, and at the back of the room an African-American woman, then 61, and a white man, 60, both born in America. The first task was for students to test their English and math proficiency. Language skills are essential so workers can communicate with their bosses, but math skills are just as important in textile work because sewing requires precise measurements. As the students worked on the proficiency tests, Tatjana Hutnyak, Lifetrack’s director of business development, went over the basics. Starting wages: $12 and $16 an hour. Transportation: The college, Dunwoody College of Technology, is on a bus line, but if students interview with a company not on a bus line, Lifetrack will help them get there. After passing career-readiness tests, students could qualify for the course, which would give them a certificate in industrial sewing — and, ideally, a job. “They want to have a career rather than packaging, assembling, cleaning jobs,” said a Lifetrack manager, Dagim Gemeda, explaining why clients were interested in the sewing certification. The Burmese women had come to Minnesota after spending time in refugee camps in Thailand. Paw Done had done piece work, sewing at home while she watched her children. The others had little sewing experience. The Ethiopian men, who ranged in age from 21 to 42, had been in this country several years. A couple were students, one was a former custodian who had moved from another state to be close to his college-bound son, and a fourth, Abdulhakim Tahiro, had been laid off from his job at an airport car rental kiosk. “It’s good, for my level it’s good,” Mr. Tahiro said of the starting wages. Mr. Tahiro and Ms. Done enrolled in the course that started last January, when about half of the class were immigrants. Another student in the course, Patricia Ramon, 56, was an entrepreneur in Mexico with sewing experience. Ms. Ramon already had a job as a sewer at J. W. Hulme, but quit to take the course with the goal of obtaining certification. She wanted proof, she said, that she had technical skills. “I am not like an old-time seamstress,” Ms. Ramon said. She expects to sew as a career, and said that making $16 an hour with health insurance would be enough to live on. The students who were not immigrants often had difficult work histories or other problems. One of them was Lawrence Corbesia, the man sitting at the back table during the screening session. He was a former machine operator and custodial worker who had been looking for work for three months. Another was Edward Johnson, 44, who was homeless when the course started. After food service and call-center jobs, he went to prison for felony assault, and had a tough time finding a job when he got out in 2009. He moved to Wisconsin to pick fruit, moved back to Minneapolis because he hated picking fruit, and was living on the streets and selling watercolor paintings when a homeless-center counselor hooked him up with the sewing program. Until now, the only sewing experience Mr. Johnson had was sewing on buttons — a punishment meted out by his mother when he misbehaved. To save money, Mr. Johnson walked the 45 minutes to and from the college. The program was overwhelming at first, he said, “so frustrating that sometimes I’d go home crying.” But he spent days at the library, watching YouTube videos on sewing techniques and studying terms used by the industry. By the end, it had gotten easier, he said, making pajamas, tote bags and aprons. So many people are on government assistance, he said. “I’d rather learn a trade and go to work — and work,” he said. The number of Chinese undergraduates on U.S. campuses in the last school year increased 43 percent from the previous year, according to the annual Institute of International Education Open Doors report that was released today. Chinese undergraduates, like most international students, are highly attractive to universities: They are usually well-educated and well-traveled, bringing a global point-of-view and sophistication to campuses. Their helicopter parents are on the other side of the world. And they hardly ever tap university resources to fund their education. View Photo Gallery: Chinese students enroll in record numbers at U.S. colleges. At the beginning of this school year, I tagged along with a group ofChinese students traveling from Dulles International Airport to the University of Virginia. In the last decade, U-Va. has seen its international student population increase 44 percent, with China being the most popular country of origin. With that influx, it becomes easy for international students to just hang out with each other and speak their native language. At U-Va. I heard many gentle reminders for students to get out of their comfort zones and meet American students. 723,277: The total number of international students in the United States last school year. 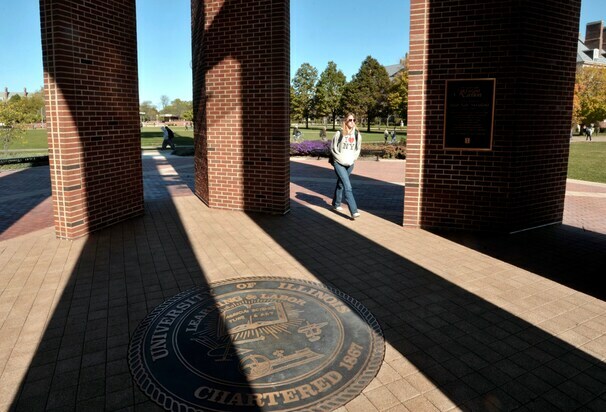 That’s a 4.7-percent increase from the previous year when there were 690,923 international students. 32 percent: The growth in the number of international students in the past decade. $21 billion: The amount of money international students spend in the United States on tuition, fees, housing and living expenses. 70 percent: The percentage of international students whose primarysource of funding for college is from their personal funds, family, government and other foreign sources. 157,558: The number of students from China, a group that makes up 22 percent of all international students. (This group grew 23 percent in one year for all Chinese students and 43 percent for undergraduates.) Other popular countries of origin are: India with 103,895 students, South Korea with 73,351 and Canada with 27,546. 8,615: The number of international students at the University of Southern California, the most popular host school last year. For even more higher education news, follow me on Twitter andFacebook. Inc. Magazine reported on it and no- “it wasn’t completely random”. In fact we at the U.S. Jobs Project like to think of it as grassroots – Guerrilla Marketing! Nobody gets anyones attention by staying at home, marketing is an active, energetic process. Obviously, Mr. Case gets that and then some. A little background on Scott Case: Timothy “Scott” Case (not related to Steve Case) is a technologist, entrepreneur and inventor and was founding CTO of Priceline, the “Name Your Own Price” company that was one of only a handful of startups in U.S. history to reach a billion dollars in annual sales in less than 24 months. As Chief Technology Officer, he was responsible for building the technology that enabled Priceline’s hyper-growth. Most recently, Scott was named CEO and board member of the Startup America Partnership, where he’ll invest his energy to drive American entrepreneurship to create jobs and sustain our nation’s global leadership. So, as you can see Mr. Case knows a little about hyper-growth, Startup’s and great ideas.